We have a horse who is having a problem running after the jumps. She comes in fairly soft—maybe one stride out she increases slightly. When she lands she wants to run. I have tried an automatic release and quieter body-over-top, in case she is running from the rider on top. Didn’t make much difference. Any ideas of exercises to try? Thanks! Sounds like you’ve already tried the normal “cures” for this problem. Let’s move on to some things you might not have tried yet. 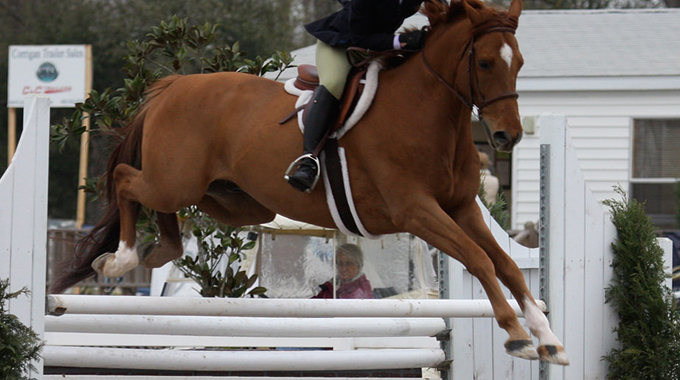 You can set two small jumps along the rail of your ring, about 60′ apart and between 12′-16′ off the rail…. so it looks like a 4 stride line. However, you are not going to ride it as a line. Instead, you will canter to only the 2nd fence each time from the rail. Jump the 2nd fence then immediately turn your cantering horse TO THE RAIL. You will actually be creating a big figure 8. Hopefully the sharp turns towards the rail, following each fence, will force her to slow down and not run off. If you have access to an indoor ring, you can also try setting a single vertical, about 30′-40′ from the end of the ring, heading towards the tall wall. Jump the small fence, and just aim her at the wall at the end of the ring. The wall will force her to stop, and it is much too high for her to attempt to jump over. 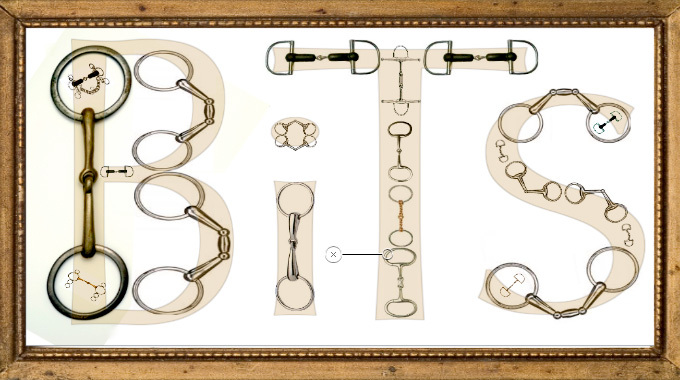 Finally, if all else fails… you could try a very strong bridle or a strong hackamore over her standard bridle. If, after any fence, she tries to run off, use that strong bridle and STOP HER ABRUPTLY!! 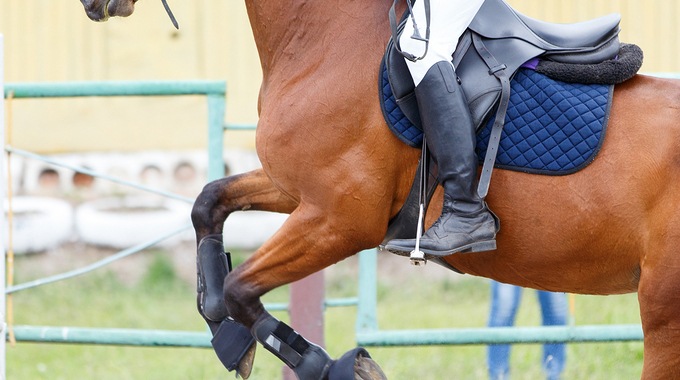 A horse who runs off after the fences is difficult to ride, disconcerting, and potentially dangerous. Sounds like you’ve already tried being “miss nice guy”…….hopefully 1 of these ideas will help you. Best of luck. 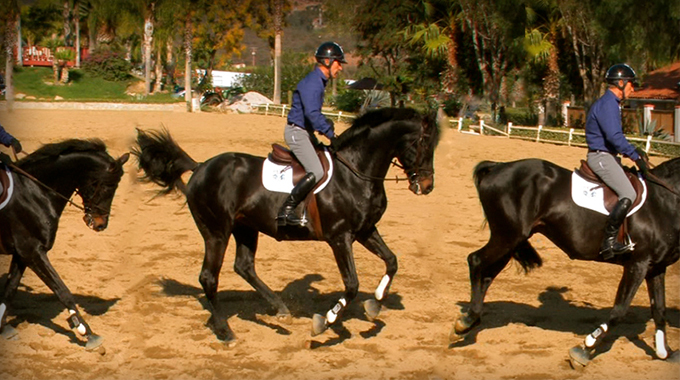 In this free video tip, Bernie Traurig teaches us a very handy tool all equestrians should have in their riding toolbox. 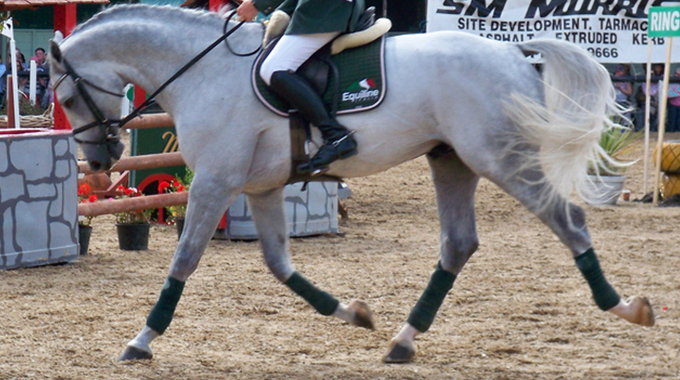 One of his versions of a half-halt that is simple to do, he calls a “nip up.” This can be used in many instances, especially on a horse that is too low in its carriage or is too heavy on the forehand. Bernie demonstrates how to use this technique properly and effectively without hanging on the horse’s mouth. Ultimately, this should be an invisible and soft correction that you should only use when absolutely necessary so it remains meaningful. This technique can also be found in the books by Vladimir Littauer (Commonsense Horsemanship) and Gordon Wright (Horsemanship & Horsemastership) where it is defined as a Half-Halt. Training Level Eventer and EquestrianCoach.com member, Kristen Schalck, gets a free training session from Bernie with her 9 year old OTTB (Off The Track Thoroughbred), JC. Watching the show jumping round Kristen presented, Bernie got a sense of just how he could help them. Kristen had some lower leg stability issues and JC had a tendency to get a bit too aggressive at the jumps, particularly in combinations, and jump past the arc. Tapping into his reservoir of knowledge gained through many years of experience with Thoroughbred horses, Bernie introduces them to the Kusner Gymnastic. 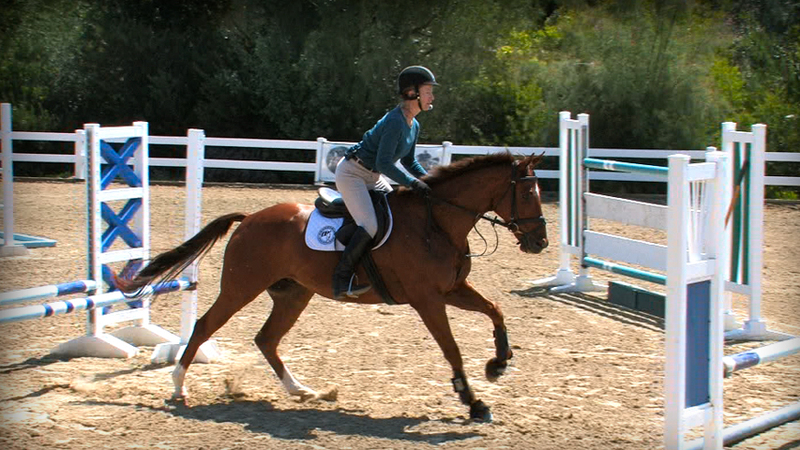 This exercise proves to successfully back up JC over the jumps, while allowing Kristen to perfect her automatic release, maintaining the contact in the air that so many Thoroughbreds appreciate. Bernie gives advice to a member who's sensitive Thoroughbred continually swaps leads every time they go to to the left. Nice suggestions. I also like trotting jumps 6 ft pole before and 9ft after. every jump and transition to halt. back up, walk off ask for trot and repeat. after the horse gets it packed, I may allow to keep canter after the jump. but ONLY if there no unwanted speeding up. 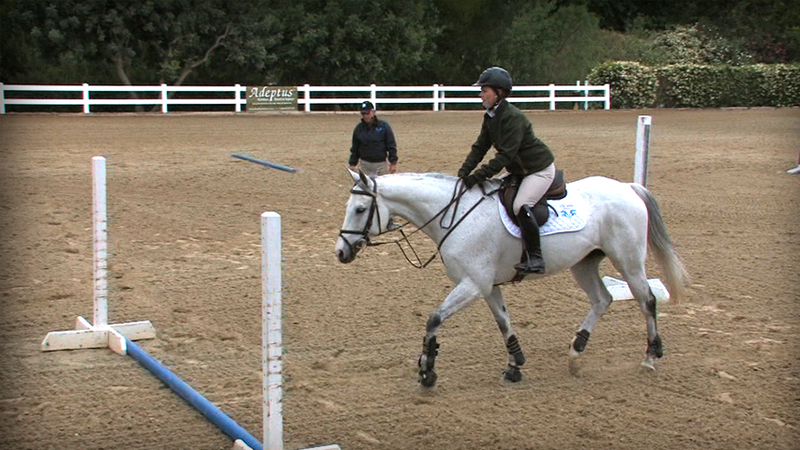 Stacia Madden gave us an exercise at her clinic: 3 poles 1 stride apart. you have to canter first pole and haul, then walk-trot-canter out. My horse was so strong and so on a forehand that he just pulled me like a tug boat. (I just imported him). A week ago I showed him with only one hand due to my dominant hand injury and we won a speed class at 1.10m. 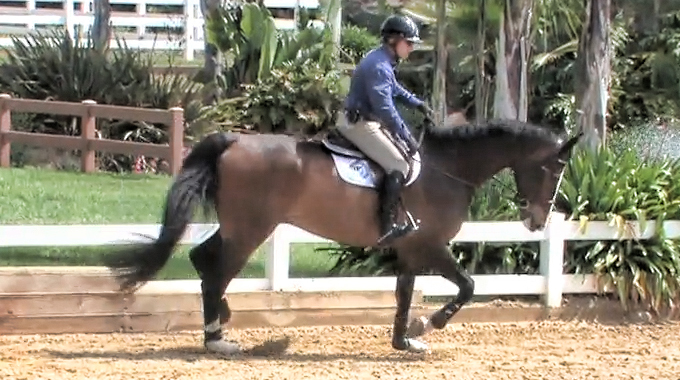 In addition COTH just had McLain Ward clinic and he too had some good exercises. Oh, Raise your hands when your horse gets strong both G. Morris and Kevin Babington teach that,- the stronger the horses get the higher your arms go… There is what I call a “sweet spot” where horse gets very attentive.. about mid neck..
I’m a little surprised that there was no mention of having the horse checked out by a veterinarian to see if the reason for the running off was due to some sort of pain. I’m sure it is an assumption that all the possibilities are ruled out, especially due to the rider’s attempt to resolve the issue by first trying to ride as sympathetically as possible. We recently had a horse with this issue at our farm, during a visit from the chiropractor, the dr mentioned there was a lot of swelling and stiffness in the horses lumbar vertebra. After a month off from jumping the horse was much better. We unfortunately have no idea if this is an old injury (he is an OTTB) or just a conformational issue that could not be examined any other way than through MRI. Regardless, he is now a very talented dressage horse and seems much happier! You’re correct all of the advice our “Ask The Expert” panelists give first and foremost runs on the assumption that pain has been ruled out. Thank you for sharing your experiences and suggestions!